Success is the result of perfection, hard work,learning from failure, loyalty, and persistence said by Colin Powell. With this belief Bandhu is sincerely continuing to serve the communities with undivided commitment and is paving the way for obtaining their social justice, equality, sexual and reproductive health and rights (SRHR). We would like to convey our heartiest thanks and gratitude to each and every compeer of our journey. At the same time, it is our strong belief that by working simultaneously we must be able to defeat any obstacle and turn the limitations to success in the upcoming year.In this edition of Spandon, Bandhu’s current programs and events have been published in brief along with some international affair news which defray great magnitude to our motive. 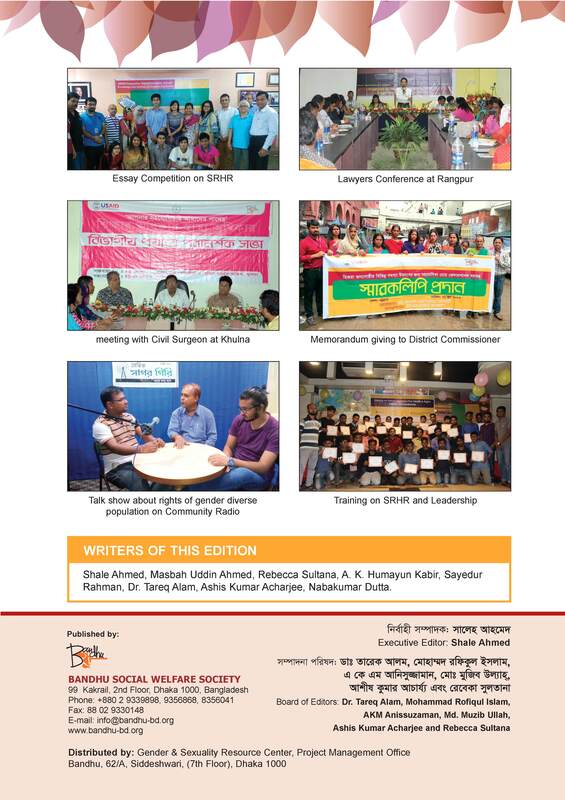 For the successful publication of the quarterly newsletter, we would like to show appreciation to the writers and editorial team who have made this turn out. At the same time, we convey our advance thanks to our readers as they are the only source of our inspiration for this publication.